The first Premier League game to take place at White Hart Lane this season promises to be a cracker. Despite early fixture congestion due to Europa League matches, both Tottenham and Swansea will come into this tie raring to go and aiming to take all three points with proactive and attractive Plan As. Swansea are still riding the crest of a wave. 2012-13 was their greatest ever season and they have begun this campaign in encouraging fashion. Going down 4-1 at home to Manchester United, while less than ideal, did not really matter: that result is not unexpected for a club of their size, so it won’t have caused too much of a dip in morale. Indeed, Thursday night’s 5-1 victory over Petrolul Ploiesti will see Michael Laudrup’s men arriving full of confidence and ready to continue on their remarkable upward trajectory. As André Villas-Boas, David Moyes and Brendan Rodgers recently said, it’s the second year in charge when a manager’s impact on his side really begins to show, and so it has proven in South Wales. If Laudrup’s tactical ideas appeared a step removed from his predecessor’s in 2012-13, then this season sees the ideals of Rodgers’ tiki-taka all-but banished to the confines of ancient history. The Swans will never go as far as to become Pulisian in their approach – if that were Laudrup’s intention then the United Nations would surely have intervened by now – and their general passing-and-pressing ideas are much the same. However, they now appear to be inspired more by Borussia Dortmund or Ajax than Barcelona. Their attacks are now lightning fast and players’ surging movement in the final third is rigorously rehearsed and perfected in training. In summer signings Jonjo Shelvey and Wilfried Bony, they have added appropriately direct and physical options of high quality, and these additions have already had a noticeable effect. The latter’s arrival, in particular, has created huge excitement: the Ivorian striker is a complete, modern number nine and his record of thirty-seven goals in thirty-six appearances for Vitesse Arnhem saw him top score the Eredivisie last season. The calmness with which he scored his debut goal against Manchester United suggested his rate could be similarly prolific at his new club. Mercifully, reports suggest that Bony will start Sunday’s game on the bench: perhaps wary of previous Eredivisie duds Afonso Alves and Mateja Kežman, Laudrup appears to be in favour of easing him in to Premier League football slowly. In contrast to Bony, Shelvey had a less-than-stellar 2012-13, culminating in a miserable summer with the England U21 side. He remains raw and prone to lapses in concentration but as the most advanced midfielder in Swansea’s 4-2-1-3, he adds a more vertical Premier League-friendly option than the talented but unproductive Jonathan de Guzmán. Shelvey’s bursts forward and thwacking long shots will be a key feature of Swansea’s more varied attack both on Sunday and throughout the season. Expect him to start and dovetail with the ever-dangerous Michu. On the wings, Pablo Hernández and Wayne Routledge are currently in fine form. In attack, the system is perfectly suited to their strengths and allows Pablo the freedom and space to use his typically Spanish combination of guile and technique to take on full-backs and serve his teammates with a never-ending supply of quality deliveries. [Pablo and Routledge] often receive passes in relatively isolated positions and either lose the ball or hesitate. This period of indecision may be the weakness that André Villas-Boas chooses to target to maximise Tottenham’s chances of victory. Normally when a winger finds himself lacking in support, it leads to the ball being played back to the defence and then forward once more. If Tottenham can win the ball or force a mistake before Swansea’s wide men decide to recycle possession, the pace of Aaron Lennon and Gareth Bale on the break […] should see Spurs carve out clear chances more easily than their opponents. Now that the Swans’ wingers cross more often and have more dynamic midfield support, that avenue of attack for Spurs seems to have closed off. However, as one door closes another opens. Last season, Swansea’s defensive unit was, by all accounts, excellent. Àngel Rangel cemented his reputation as one of the Premier League’s most intelligent and dependable wing-backs, while Ben Davies enjoyed a near flawless breakout campaign. In the middle, Ashley Williams did enough to earn links with Champions League clubs and but for the club’s late slump Chico Flores would have made it into this writer’s team of the season alongside Jan Vertonghen. Their brilliance was as much down to the protection afforded by the system than their individual heroics. Only four teams enjoyed more possession than Swansea last season and, as Barcelona and Spain have repeatedly shown, it doesn’t matter how apparently shoddy you are at the back if your opponent doesn’t have the ball. With a more gung-ho approach now in favour, Swansea will have less control over games and consequently their opponents can expect to enjoy more of the ball. If Laudrup starts Bony, Michu and Shelvey together, there will certainly be opportunities to exploit adventurous positioning in the midfield and get at Williams and Chico early and high up the pitch. 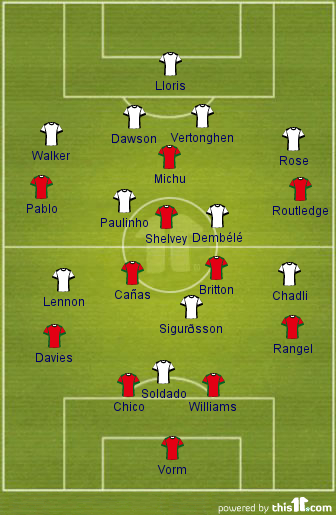 Tottenham’s line-up basically picks itself after Thursday’s easy victory over Dinamo Tbilisi. As with last week’s team selection, the only question marks are over the configuration of the second band. Sandro, Paulinho, Étienne Capoue and Mousa Dembélé are all available and while the former is lacking match fitness, it wouldn’t be a surprise to see three of the four start in the same 4-3-3 we have seen in preseason and Europa League fixtures. The key to victory for Spurs will be in the speed of their attacks. Sunday’s performance against Crystal Palace was dominant but showed the same lack of killer instinct that characterised last season’s most frustrating home showings. If Tottenham are prepared for this new, penetrative Swansea attack and remain ready to exploit its shortcomings, Roberto Soldado will add to his already impressive tally and the points will be in the bag. 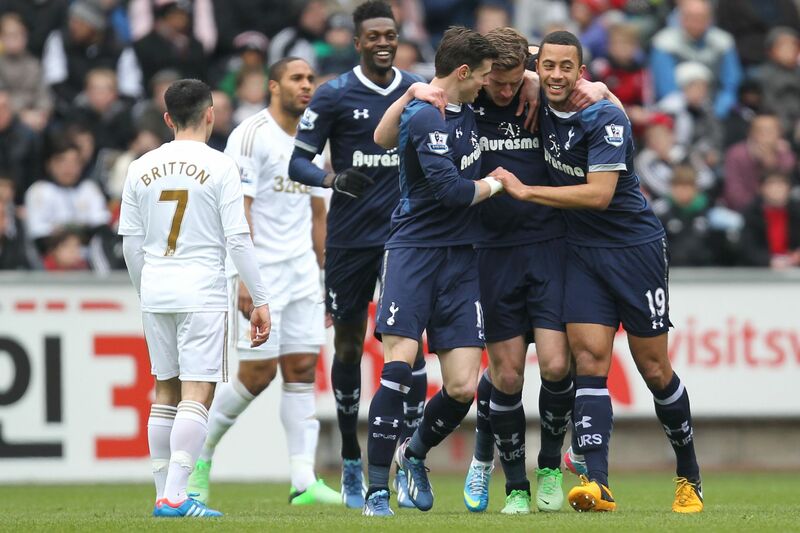 If not, then Swansea could very well claim their first scalp of the season.